The Bank of Latvia have issued a new coin which remembers one of the region’s most decisive acts of both public participation as well as a massive statement of will by the people of the three Baltic States wishing to demonstrate their desire for freedom. The idea of freedom is one for which people have always been willing to pay the highest price. In Estonia, Latvia, and Lithuania the yearning for freedom found a powerful expression at the end of the 1980’s. The Baltic peoples were united by a common goal: to break off the shackles of the totalitarian empire of the Soviet Union which had meant subjugation for half a century and which had originated in the Molotov-Ribbentrop Pact. This so-called pact of mutual non-aggression signed on the 23rd August 1939 by the USSR and Hitler’s Third Reich was supplemented by a secret protocol, which in fact meant the division of six independent European states into spheres of influence and occupation. The Molotov-Ribbentrop Pact prepared and initiated World War II. The USSR occupied the Baltic States in the summer of 1940 in direct consequence of the pact. The social and economic orders were forcibly changed in accordance with the interests of the USSR and the peoples of Estonia, Latvia, and Lithuania were subjected to the dictatorship of communist ideology and regime. The three Baltic States were incorporated into this superpower, experiencing deportations, nationalization of private property and collectivization. This national nightmare was to last for more than half a century leaving these countries behind the “iron curtain” and in isolation from the rest of the world. Fifty years after the Molotov-Ribbentrop Pact was signed, on 23 August 1989 at 7 p.m., about two million residents of the Baltic countries joined hands forming a 600-kilometer-long human chain that joined Tallinn, Riga and Vilnius for 15 minutes. This unique action drew the attention of the entire world, highlighting the historical injustice and asserting that the idea of freedom and independence is very much alive in the minds and hearts of the three Baltic nations and with this one single act, the Baltic Way came into being! In 1991, the Baltic nations once again regained their statehood and political independence. The withdrawal of occupation troops, admittance of the Baltic countries to the United Nations and later to the European Union, NATO and many international organizations were natural milestones in their subsequent journey. On 30 July 2009, UNESCO included the documentary testimonies of the Baltic Way in the international register “Memory of the World”. This Latvian 5 euro coin is dedicated to the 25th anniversary of this extraordinary event demonstrating unity among the three Baltic nations. The coin is produced by the Royal Dutch Mint on behalf of the Bank of Latvia and is designed by artist Visvaldis Asaris. 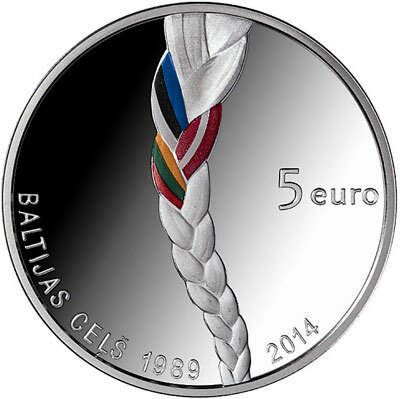 The obverse design includes a depiction of a crossed braid with ribbons in the colors of national flags of the three Baltic Republics woven in it. The inscription “5 euro” is on the right. The lower left part of the obverse bears the semi-circled inscription BALTIJAS CEĻŠ 1989, with the year 2014 on the right. The reverse displays a vertical image of a tree trunk with exposed roots. There are two semi-circled inscriptions – ATMOSTAS BALTIJA (Awakening Baltics) on the left and LIETUVA LATVIJA EESTI (Lithuania Latvia Estonia) on the right. 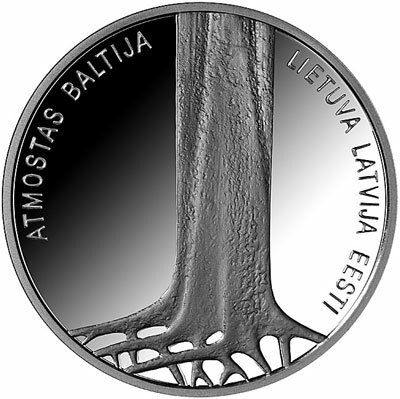 The coin is available directly from the Bank of Latvia, for more information on this and other coins issued, please visit their website at: http://www.bank.lv/en/money/collector-coins-at-the-bank-of-latvia-cashiers-offices Information offered in both Latvian and English, international orders dispatched. A list of previously issued collector coins denominated in Lats which are still available for sale is included on the main page. First 2 Latvian 5 euros silver commemorative coins had only mintage of 5000. So why does Baltic Way and Old Stenders 5 euros silver commemorative coins has 10,000 coins minted? Does this mean that cheaper coins? Baltic countries ( Lithuania, Estonia and Latvia ) usually mint coins around themes which are local in nature, closely associated with their history, geography, heritage and cultural and they hardly venture into popolur global themes ( like on going WWI ) or like what most obscure mints do. It is due to their intense and undiluted focus on local flavour that attracts me towards them and also explains to an extent lower mintage ( as most international clients may not be truly able to appreciate local themes of their country),whereas 25 years ago Baltic way had indeed attracted world’s to the plight of these countries, making this movement a historic event which most international clients would be able to associate with. I also recall that few year earlier latvia had also issued a coin with relatively higher mintage of 15000 odd pieces and people bought it because they could associate with it . it was ‘ 500 years to the first Christmas tree in Riga’ – historian agree that first Christmas tree was indeed decorated / installed first in Riga. Latvia and Lithuania in particular as the two of the three Baltic states who do issue collector coins on an annual basis do tend to highlight as much of their individual aspects of their cultures and own histories. Estonia of course does this as well but a bit less frequently. If you don’t know very much about the three countries but like collecting modern coinage, with just a little research, you will become more familiar very easily. As far as the increased mintage (which I forgot to include…) it could be explained that it may be an expectation by the Bank of Latvia of a higher demand for the coin by collectors from the three states since it was a joint effort in 1989 – I know there were celebrations and remembrances of the anniversary in all three countries simultaneously. So what is next Latvian 5 euros silver commemorative coins for this year? And whould be next year issue for Latvian commemorative coins? Glad to hear you’re pleased with your choices – I look forward to possibly seeing this coin at the World Money Fair in February depending if any of these particular coins are left by then, I do like the design myself!